Caroline England is a former divorce lawyer based in Manchester. Beneath the Skin, her debut novel, was published by Avon HarperCollins in October 2017. Her second book, My Husband’s Lies, was released in May 2018 and became a top ten kindle bestseller. Her new book BETRAY HER is out on 14th March and available for pre-order! I thought that no book could have quite as many twists as My Husband’s Lies, but then I picked up Betray Her and instantly became lost in the gripping story. Caroline England’s third novel is expertly crafted to shock the reader as many times as possible and I found myself gasping several times as all the clues left in the novel fell into place. 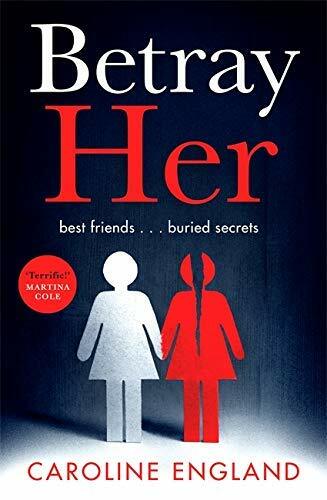 Betray Her has everything that you’d expect from a psychological thriller and much more; a whirlwind of jealousy, illicit relationships, secrets and lies that will sweep you up and carry you along until the end. "I thought that no book could have quite as many twists as My Husband’s Lies, but then I picked up Betray Her and instantly became lost in the gripping story. Betray Her has everything that you’d expect from a psychological thriller and much more; a whirlwind of jealousy, illicit relationships, secrets and lies that will sweep you up and carry you along until the end." We're live with Caroline England and Sam Carrington, chatting about their new thrillers, Beneath the Skin and Bad Sister.Ask your questions below!